Spring has sprung and what better time to think about more active ways to travel to work. Now it’s getting warmer, and is lighter in the mornings and evenings, this is the time to consider different ways to travel around the region. 20 per cent of car journeys could be avoided if other means of transport were used more readily. You’ve maybe already got your bike out for weekend leisure rides, or are taking some lovely spring walks in the countryside, so why not extend these practices to your daily commute if you only live a short distance from your workplace? 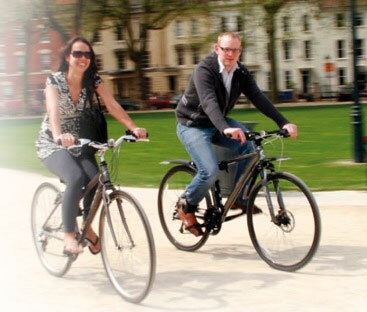 As part of their Local Sustainable Transport funding programme, the four councils across our region (Bath & NE Somerset, Bristol, South Gloucestershire & North Somerset) are challenging individuals and local businesses to participate in a competition to find those making the most active contribution to helping reduce traffic congestion and improving air quality in the West. The “Jambusting” Commuter Challenge starts on March 26 and runs until April 27. It’s designed to encourage fewer journeys to work by cars occupied only by the driver, by persuading people to try more sustainable ways to get there such as by public transport, Park & Ride or car sharing; or more active travel for shorter journeys such as walking or cycling. ‘Jambusters’ taking part in the challenge will maintain an online travelog of their journeys to and from work; and will score points according to how sustainable the mode of transport used is, the distance travelled and how long they actively participate in the challenge. They will be able to add their scores to colleagues in their workplace to contribute to either a team within a business or a business-wide total score. There are prizes on offer which have been donated by local businesses, which will be awarded against a variety of criteria including overall top individual contribution and top business award. The challenge will apply weighted scores so that small businesses are not disadvantaged against the larger employers and everyone has an equal opportunity to win. If every driver switched to another form of transport for only one day per week, congestion could be cut by 20 per cent. www.travelwest.info is a new online travel resource with information about different travel options around the West of England, as well as up-to-date travel news and timetable information for buses and trains.